Are you annoyed by having to wait to download a handful of service packs, updates, and hotfixes from Microsoft whenever you install a fresh copy of Windows XP? Are you concerned about your computer being attacked in the short time between the Windows XP install and applying the updates from Microsoft? Why not make an updated (or "slipstreamed") Windows XP CD that has all the updates already? 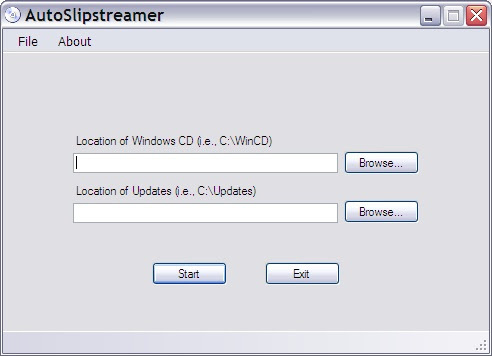 I created a tool called AutoSlipstreamer that allows you to easily slipstream downloaded service packs, and other updates for Windows XP from Microsoft into your installation source or Windows XP installation CD. Then, the next time you use your new CD to install Windows XP, all of the updates will be there. Copy the contents of your Windows XP CD to your hard drive (i.e., C:\WinCD). Then, just drop the downloaded update files into a folder, point AutoSlipstreamer to the proper folders, and hit Start. The updates will be automatically slipstreamed into your Windows XP installation CD. To burn your updated CD, download IsoBuster and extract the boot image from your original Windows XP CD. Save the boot image (usually called Microsoft Corporation.img), then use a burning program such as Nero to create a bootable CD. Burn the contents of your updated, slipstreamed Windows XP CD from your hard drive (i.e., C:\WinCD) and select the boot image file you extracted above and use the same CD name as your original Windows XP CD (i.e., XRMPVOL_EN). (More detailed instructions here) You now have an updated Windows XP installation CD with the latest updates from Microsoft. AutoSlipstreamer requires the .NET framework available from Microsoft. UPDATE (6/4/08): There is a better, cleaner, simpler solution for slipstreaming and customizing a Windows XP install CD: nLite (http://www.nliteos.com/). I've used it, and it rocks! Try vLite (http://www.vlite.net/) for Windows Vista custom installs.